Are your Labels Printing Misaligned? Here’s a Solution! Jackrabbit can help you quickly print labels for a group of students, as well as mailing labels for families. Even better, Jackrabbit can help you easily print labels for costume bags to make your costume handout process even smoother. But how is that helpful if your labels aren’t printing with the correct alignment? All labels produced by Jackrabbit are formatted to a PDF file. Most browsers have a built-in PDF viewer with their own scaling parameters. A browser is not a dedicated PDF reader, however, It’s a nice feature to have. 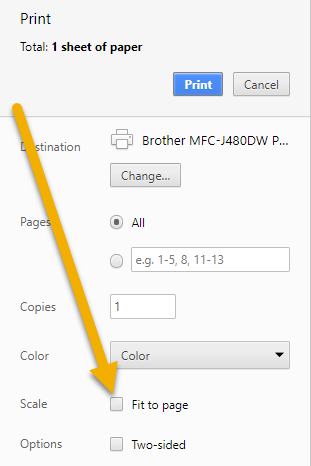 The browser settings, your printer, and what you have set as your default PDF viewer affect how the labels print. Things can, and do, go wrong. According to Avery Design & Print Online, Apple’s Safari browser does not print accurately. Your best option is to save the labels and open in Adobe Acrobat Reader prior to printing or try another browser. When opening the file directly in Adobe Acrobat Reader (instead of a browser), you should use the Properties button beside the printer name, followed by selecting the Advanced tab to get to the Scaling fields. Note that Adobe continues to update their software. Always check your settings to make sure they are where you need them to be!